For weeks now, I’ve enjoyed Beth’s You Capture carnival, which is hosted at her fabulous blog I Should Be Folding Laundry . This is my first time joining the party, and while I know my picture isn’t your typical autumn portrait, I hope my words will explain why this captures fall best for me this year. It has been such a weird autumn. Not only has the weather been downright bizarre – our September was hotter than our August, for example, and October has been freakishly cold and gray and rainy – but I’ve been dealing with the first trimester blahs. I normally glory in this time of year. It’s so beautiful. The sky is bluer than the brightest peacock, the leaves shine like jewels. The air is crisp, the apples are juicy. We spend every minute we can outside and marvel at the extravagance, even as we ache at its fleetingness. In fact, looking back over the last few months, I’ve decided that I actually had first trimester depression (which is not a technical medical condition, as far as I know, but stick with me here). I’ve never known post-partum depression, but I’ve had friends who’ve grappled with that dark beast, and I feel like I’ve had my own wrestling match the last few weeks. I hate feeling sick, and dealing with nausea 24-7 for weeks on end drains every ounce of optimism I have. I live in a fog of hopelessness. I isolate myself, mostly because I don’t have the energy to be anything other than a blog. But I also hide in my cave because I’m miserable that I can’t do anything to stop this downward spiral. I couldn’t even pray. It felt like God’s light couldn’t penetrate my fog. I was alone, miserable and completely without hope. Stupid? Absolutely. Real? Unfortunately yes. My experience, small in scope as it was, has given me a new compassion for people who deal with lifelong disability. They must have to fight that battle on a daily basis. Life loses its luster when you don’t feel good. I have a renewed energy to pray for those I know who deal regularly with disease, pain and frustration. Lord, be so very near. I say this all so you can know: I am getting better. I’m starting to feel again, which is a gift, and I’m starting to regain a sense of hope. 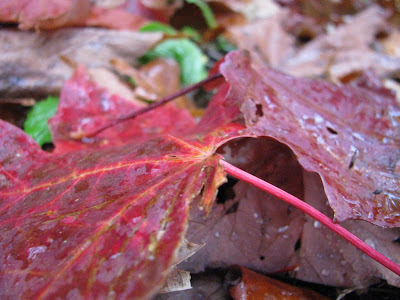 I even see a seed of beauty in this season, this strange autumn that has been more bluster than beauty. For in the midst of the fallen, there is promise for the spring. Praying that hope and beauty and optimism return in full force before winter sets in! Glad your personal sun is starting to shine. This post described the first half of both of my pregnancies. Especially the first one when I couldn't fathom it would actually end in a baby. So sorry you had to deal with this. I've been in your shoes and completely agree with Mocha with Linda. Until he was born. Then I did it two more times. Once you know the prize at the end, it's all worth it. But that doesn't mean that it's all happy and laughter. It's wonderful that you're talking about it because when I went through it and tried to find help, there was NOTHING out there admitting or even hinting to depression DURING the pregnancy. Only terrible moms would admit they were unhappy during the pregnancy...the stigma must end. Best wishes and Congrats again! As someone who is finally dealing with my post-partum depression, I totally understand. There is something that stops you from helping yourself. It makes no sense to anyone else. It most definitely prevents you from asking for help. I have a friend who was depressed in her first trimester with her second child, so it must be a "real" thing. I'm so glad you are feeling again. That is huge. Here's hoping some energy follows! Oh, I'm glad you're feeling better. It HAS been weird lately. It's good you are seeing the promise. I appreciate you! Both times I was in first trimester, I thought about my dad (who died of cancer) and the daily nausea and fatigue he battled for the last year of his life. Like you, I now have increased compassion for those who are going through illness. God never does anything (including the icky parts of pregnancy) without purpose, right!? i know exactly how you feel. i feel the same way when i'm pregnant. it feels like nothing will make you feel better so why try. it's so defeating. i'm glad you're doing better. I feel like that during the entire first trimester, as well as the third. I'm in week 35 now! I know what you mean about having more compassion for those who suffer with debilitating illness on a regular basis. This has really made me appreciate the fact that I WILL eventually feel better, and it reminds me to pray for those who might not have that hope.